The new and improved formula is finally in! This formula has less frosting and keeps its pure white colour when burnt or remelted. 0ur S16 Deluxe Soy wax's development has been assisted by real, everyday candle makers alongside an Australian government approved lab based in Melbourne. Made from 100% natural, plant based products our S16 Deluxe Soy wax is similar in it's formulation to another popular, yet recently discontinued wax. The creamy soy finish you will see when using S16 is nothing short of remarkable! Candles produced with S16 Deluxe Soy are ready to be placed on any high-end boutique shelf. S16 Deluxe Soy has an even and calming burn, fantastic container adhesion and great overall performance in regards to scent throw. This variety, as advertised - is a completely plant based, natural wax. Containing hydrated soya oil and unique, natural emulsifier. S16 Deluxe Soy has been created through the intersection of nature and science. By hydrogenating a by-product of the soy harvesting process, we're able to use this thicker and tougher compound to harden and stabilise the natural soy wax resulting in a 100% natural product that performs consistently like any great wax should. Finding which blends, wicks, jars, temperatures, percentages and fragrances yield the best results for you - we encourage you undertake many different tests and trials to achieve your perfect ready to go candle. Contents: 100% Hydrogenated Soybean Oil blended with the addition of a unique plant based emulsifier. S16 Deluxe Soy is a durable, resilient wax with fantastic post-pour appearance. We suggest you take care preparing the pouring conditions of your candles and to always run a test in those conditions before mass producing any of your candle ranges. Our trials have indicated that 22°C is the ideal room temperature when making soy candles. 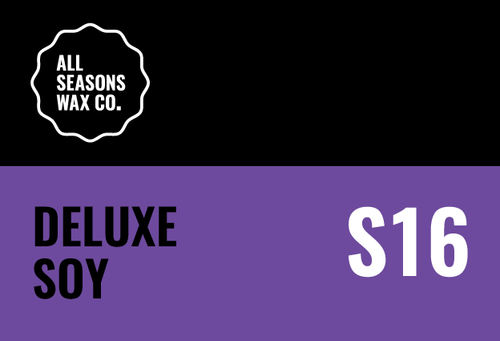 We recommend S16 Deluxe Soy for candle makers of all abilities - it is a uniquely balanced wax which has excellent performance across the board.